Holiday memories are a funny thing. Some destinations you’ll remember for a view, for an event or for a particular monument. Vietnam? It’s a place I remember by flavour. When I toured the country six years ago, I did so pretty much led by my palette, seeking out the best street food hawkers serving up lemongrass-scented skewered meats, delicate fresh spring rolls and noodle bowls. And the flavours were unlike anywhere else I’d been – almost universally dairy free, low on spice and oil, and with a huge focus on fresh herbs, Vietnamese food is lighter, brighter, fresher and subtler than that of its Asian neighbours. At Lao, the aim is to upgrade and elevate these traditional flavours in a modern way, and I’m initially in two minds about whether the cuisine needs either. I needn’t have worried. While the plating is elegant and the restaurant far more serene than Ho Chi Minh’s street corners, the flavours are all present and correct – and the elevation comes in large part from the kitchen’s huge reliance on the on-site organic garden for its veggies and those all-important herbs. 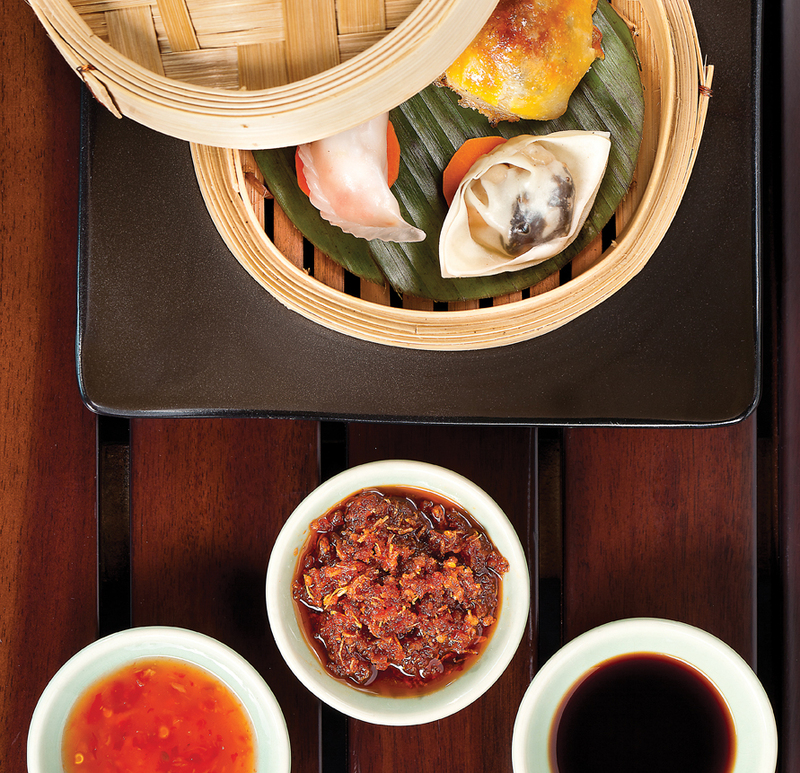 The small plates list is long and divided into sections ranging from dim sum to fried spring rolls to noodle soups. We plump to share three dishes as starters and while chicken skewers with peanut sauce are good, they are definitely overshadowed by a pair of taco-shaped Vitenamese rice paper crisps topped with a delicately-flavoured mix of chopped shrimp, shallots, garlic, ginger, mint and coriander. The star of the small plate show, however, is the green papaya salad, the noodles of fruit shot through with fresh herbs, dried beef, peanuts and chilli for a result that’s the perfect balance of spicy, sweet and salty. Of all the dishes we eat, it’s the most honest and authentic. The mains menu veers away from hawker favourites in favour of fine-dining refinement, so we follow our waiter’s recommendations and opt for some distinctly high-end, if not strictly Vietnamese, dishes. Three obscenely large tiger prawns arrive deep fried and battered, sitting atop a jumble of fresh veggies from the garden and a coconut milk, chilli and oyster sauce. They’re terrific. Crisp and hot on the outside, juicy and tender within, with just enough spice in the moreish sauce to make it well worth mopping up. One of the restaurant’s most popular dishes, wok fried beef tenderloin, features generous chunks of tender, medium-rare Wagyu in a garlic and black pepper sauce, with red pepper and some fresh and juicy homegrown cherry tomatoes. It’s unlike anything we ate on holiday, and I’m not sure Wagyu features very much in Vietnam at all – but it’s delicious as well as decadent, so we decide to let authenticity slide. As we aim to serve elevated versions of traditional Vietnamese dishes, we attempt to use as authentic ingredients as possible. This is why we are so proud of our organic garden. It allows us to grow and source traditional flavours used in Vietnamese cooking directly from our backyard, ensuring that the products we use in our cooking are fresh and clean. How important is local sourcing and understanding the origins of your produce? Healthy eating and the sustainable sourcing of food are becoming increasingly important to consumers in the luxury tourism sector, and that is affecting the business and operations of many restaurants and cafés. How much do you use the on-site garden and how beneficial is it? Do you think customers are becoming more aware of where their food comes from? There is definitely a greater awareness of where the food we serve comes from and how it was grown. In Lao, we pride ourselves on serving our guests healthy and pure flavours, and we are pleased to see that these are well received by our guests.